How many of you have had a portion of your backyard covered with stamped concrete and then later decided to fill in either more of your yard or had a pool put in with the area around it stamped in a color to match the pool. This can give you poor color consistency. Well, now you have a situation like this homeowner had. The original stamped concrete that looked fine alone, now does not match the pool or surrounding area. There is no color consistency. Is there any way to make the older dated concrete look fresh and new? Is there a way to change the color of the older original stamped concrete to become consistent with the new fresher look? 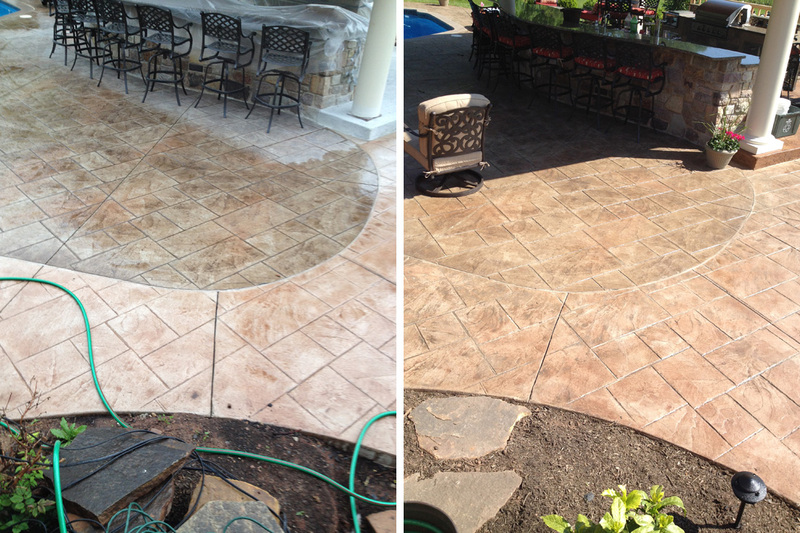 Of course there is and this is how one homeowner achieved the beautiful after effect on her stamped concrete. Her stamped concrete projects had 10 YEARS between them!!! While color mismatches are to be expected, she was able to dramatically improve her situation to where the two areas blend much more discretely.The color consistency was improved 100%!!! Both the new and old concrete areas were antiqued with 3 different colors of Proline EZ-Tique, thus giving both areas a subtle, but common/shared color effect. Once the antiquing procedure was completed, she sealed all areas with our SDI Stamp Seal – Klear Gloss 2.0 and was thrilled! While the colors may still illustrate a slight difference in shading, the improvement was substantial. All of these products and the necessary tools to produce this amazing effect are available at Sealant Depot.